I spent the final minutes of my 25th year eating funnel cake cake and dancing it out in Malibu with some of the best people in the world. You know when you’re a teenager and all you want is to get a glimpse of what your future self will be like? I hope my birthdays for the rest of my life are similarly happy. I hope I ring in each new year with people I love and good food and some ridiculous music, just because. I hope when I’m 50 and 72 and 95 and taller than any grandma ever was, that I still am dancing it out on my birthday, reveling in my moment as the Great Sparkling Queen Star of the Universe. The older I get the more I think being a grownup is a journey not a destination. It’s not a spot that I will just “arrive at” one day because I turn 26 or because I have a real budget or because of anything going on in my life. Being a grownup is a slow, sometimes painful limp towards the person I want to be. Yesterday I limped along with funnel cake and glitter skirts a whole lot of love. I have good feelings about this 26 thing. Who is the right girl for Harry? The royal family is nothing if not a bunch of women with fantastic hair. Is this an overcompensation for the male pattern baldness gene that plagues their Y chromosome? Only Freud himself would know. So what about Harry’s loves? Whose hair is up to the task? 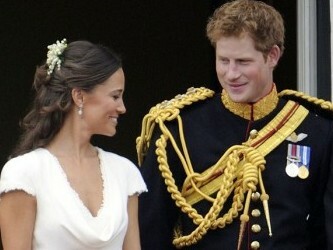 Chelsy has the royal hair thing on lock. You can just see her tresses under an absurd feathered hat as she laughs with Wills and Kate and George, all natural and glossy-like. Cressida’s hair has more of a bohemian vibe, like, “Hey I just woke up and this is what my hair looks like, suckers.” Also, note the Lauren Conrad braids. Round 1 Winner: Cressida, though Chelsy’s luscious locks shouldn’t be underestimated. Whomever Harry ends up with will have to be Best Friends Forever with Kate, as William and Harry are BFFs, and this is just a rule. It appears Kate would be easy to share a giggle with, “Haha I love Dirty Dancing, too!” but the question is not of ease, the question is of kindred soul-dom. We know that Chelsy attended the royal wedding and has years of double dating and Rock Banding with the Wills and Kate (one can only assume!) I have to give her a leg up here. ALSO look at that picture. That’s some seriously long friendshipping happening. Does Cressida have a picture with pre-perfect locks Kate? Exactly. Cressida seems perfectly lovely, if a bit more daring than Kate, but she simply doesn’t have the history. I see Kate as the older and wiser sister here, sweetly leading Cressida with the force of her already-iconic example. Random but important side note: I know people love to talk about Harry and Pippa and their shared smiles at the wedding and how cute that little happily ever after would be, but hello to the power of blonde, Pippa is not his type. Obviously the make or break point in any relationship, whose names match up best? Princess Chelsy is very modern, like, look, we’re hip to the times, we have a royal Facebook page AND we just allowed women to inherit the throne! Boom. Princess Cressida just has a ring to it, doesn’t it? Regal, really. 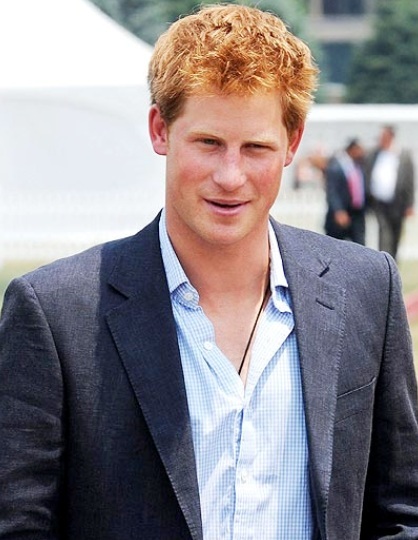 Cressida and Harry were introduced in 2012 by his cousin Eugenia/aka Owner of THAT royal wedding hat. Cressida is a dancer, student, and the daughter of a former British “It girl” and businessman. Really we don’t know much more about her other than she’s bringing scrunchies back. Thanks, Cressida. Chelsy would be the type of princess who wore tailored outfits and black Middleton wedges and fit in oh-so well to royal society. Cressida would be the type of princess who wore overalls and neon sunglasses, and bucked all royal trends, thus earning her nickname, “The anti-Kate.” First Princess with duckface selfies is all I’m saying. Round 5 Winner: Cressida. I think we all need a little more overall wearing princesses in our lives. I know! The points don’t add up, but you can’t add up points in love. Chelsy was Harry’s first love, they’ve been on and offing it for years, and I think his torch for her is as bright as Kate and William’s wedding. Here’s the thing about on and off relationships. You never really believe they’re over. You figure if the two of you survived The Great Christmas Party Incident of 2011 or the 700 “I never want to talk to you again” conversations, then you can survive anything. You figure if you forgave him for not coming to that wedding, he can forgive you for that stupid thing you said when you were tired and angry and dramatic. Your relationship, The Relationship, is bigger than that. Here’s the thing about on and off relationships. There’s this forever feeling of “maybe.” This idea that, “Well it’s not the right time for us right now because of my school or his work or my need to eat a donut at this very moment.” And you realize how ridiculous you are for thinking that, and how absurd your excuses are getting. But whatever. The two of you always come back to each other. Here’s the thing about on and off relationships. No one is going to compare to Him, at least not at first. They haven’t devoted years to figuring out what you love and hate. They don’t have the natural smoothness, the comfortable physicality, the history. They don’t understand you like He does. So when you find yourself on another bad date with another guy you have zero chemistry with, you end up contacting Him and reminiscing about the good old days. Because, man, that was love, wasn’t it? And you’re never going to find that again. And you make your life a self-fulfilling prophecy. Here’s the thing about on and off relationships. You’ve gotten so practiced at telling everyone, “No, we aren’t dating right now…” and leaving it up to their imagination, that you can’t even face the reality of the relationship—that is in your imagination. It’s only in an imaginary future with an imaginary person that is not the individual you’ve been breaking and making up with, that this dysfunctional relationship could work. But admitting that would feel like admitting that years of your life were a mistake. And you can’t have made that big of a mistake. Here’s the thing about on and off relationships. They aren’t nearly as romantic as they seem in the movies. There’s a whole lot more tears, and a whole lot more people messed up in the process, and if you could go back in time you would just make a clean break in the first place. Or maybe you wouldn’t. Who even knows at this point. Because that’s the thing about on and off relationships. You can’t help but think that maybe there’s hope. You can’t help but think that maybe this time it will be different. When Hilary was younger, she used to say her favorite day of the week was Monday simply because Mondays don’t get any love and she wanted them to feel important. I think that sums up Hilary and her Pollyanna heart rather well. I think that sums up me and my crotchety old lady heart rather well. I’m always, always more interested in the Mrs. Snows of stories, but that’s another post for another time that I promise I’ll get to one day when I’m not talking about WEDNESDAYS! At this point in my life, it feels like I spend all day and all night on campus, all of the time, always. And as beautiful as Pepperdine is, and as excited as I am about its new tea station (honey in the house!) this is too much time for me/anyone to spend on this/any campus. But then there are Wednesdays! Wednesdays I exercise and clean. I read the book that’s been sitting, staring at me all week. I cook! I make Hilary’s beef stew and she has to field 10,000 questions like “Where do you find beef stew meat in the store?” and “Explain your salsa choice in depth”– the sorts of things only someone who never, ever cooks asks when they try to make a three-step recipe. This is what Wednesdays are for. Wednesdays are for adding another three-step recipe to my repertoire and texting any one of my 12 to 15 very close friends about my success. Okay, texting every one of my 12 to 15 very close friends about my success. Wednesdays I go on walks and take pictures. I paint my nails. I blog and I check on online orders that haven’t arrived. I run grownup errands, and catch up on sleep, and brainstorm articles, and sometimes, if I’m very, very lucky, I write for fun. I curl up in my newly cleaned room with newly cleaned sheets and I write those stories I’ve been wanting to tell but haven’t had time to because of life, but now have the time to because of Wednesdays. Me and my Mrs. Snow soul are very, very glad to have you in our week. On Friday I headed to Disneyland with my mother, my baby sister, my baby sister’s friend and Caitlin/Thelma/Ben. There is probably a more fun way to phrase that sentence, so I’ll let you get on that. We walked around looking like mice all day because before we put on Minnie ears my energy was at a 0 and after we put them on my energy was at a 1 and we need to take these victories where we can get them. I really need to practice my photo taking skills, especially if I’m to call myself a blogger, but it just seems so out of character. You know those adorable girls on Instagram who just casually laugh and hold each other all the time and you go, “Is this real life?” and “That seems exhausting to cultivate”? Yes, well that seems exhausting to cultivate and also nothing like my real life. She hasn’t actually posted any because she loves me, but it is frightening to think that those photos of me are still out there. What if they fell into the wrong hands? I believe the greatest blessing to come from technology is the freedom to delete photos and try again and never, ever mention they happened. And now that my Disneyland post has taken a drastic turn for the photo, we will end with one last, happy picture and the knowledge that on Saturday I woke up and had a Disneyland caramel apple for breakfast. The other night after class I headed up the PCH to the place formerly called home. I hadn’t done that yet this semester for a number of wishy washy reasons that involve carpooling and late classes and other things that seemed important but probably weren’t. Last week, though, I made it to North Malibu and back to the Caitlin/Jill apartment of yore. Cait screamed when I knocked on the door. A loud, over-the-top scream that continued on even when she let me in the apartment. I have missed that more than I thought. We spent the night sitting on Caitlin’s bed talking about a little of this and a little of that and a whole lot of nothing. Which is to say, soon we found ourselves exactly where we’ve always been. We laughed at my inappropriate laugh in class. We laughed at our latest dating disasters. 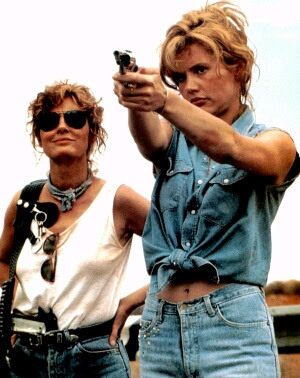 We laughed as Caitlin suggested we were Thelma and Louise and pulled up a picture of Susan Sarandon and Geena Davis and decided she was a Geena and I was a Susan. I mean, the scarf and glasses. We laughed and laughed and talked and talked and at one point I did a dramatic reading of the Thelma & Louise Wikipedia page so we could relate it to our lives. I find myself giving a dramatic reading of something or other quite a bit these days. It’s one of those things I’ve discovered about myself in adulthood and knew about myself in childhood—I love to read things out loud. I can’t tell you exactly what it was about that Malibu evening that made it so special. It was simple and regular and I don’t remember most of what was said or done. I just remember the feeling. It’s the feeling that I forget I need when I just go through life and don’t pause for glitter skirts, Thelma and Louise, and An Affair to Remember nights. The other morning I woke up and wanted to write. This is a non-thing for me. I am firmly in the, “Let’s do everything between the hours of 11:00 PM and 4:00 AM” camp in life, along with the other zombies in the world who shuffle along, cursing themselves for choosing the wrong end of the 2:00 AM debate. The world is not kind to night people, of this I am sure. And they smile and I smile, but I have a feeling we don’t really understand each other. Or at least I don’t understand them. We are a different species of humans, morning and night people, two that probably weren’t meant to interact except during the golden hours of 3:00 PM to 5:00 PM when we are both fully awake and functional. It’s looking to be a very important next seven days over here in LA. Inspired by this post about being 20 years old and what that means. Twenty was a big year for me. Looking back, it was maybe The big year. The year where all the things that make me who I am today were set in motion. The year I was presented with some of my first Important Life Lessons, and the year I completely failed to figure out what most of them meant. Twenty was a turning point. At 20 years old, I was in graduate school at the University of Utah. I was studying social work and interning at Valley Mental Health and eating a lot of Swedish Fish and cream cheese bagels from the Marriott Library. It’s funny how certain foods are associated with certain times. It’s funny how I don’t eat Swedish Fish much anymore. At 20 years old, I was positive I knew how my life would go. I knew what career I would have. I knew what boy I would be with. I knew that everything was about to come together in my life, finally! Finally it seemed, things were about to all fall into place. It would take me four years to quit the career I had at 20. It would take me a very, very, very long time to quit the boy I had at 20. In fact, we might call 20 the beginning of my Kate Moss “years and years of tears” phase. At 20 years old, my very best friends in the world and I were all single. My first best friend got married later that year and from there, one by one, my favorite people suddenly found new favorite people. And while these girls remain my kindred souls, 20 was the last time our friendships were so carefree and spontaneous and silly. Twenty was the year grownup friendships began. Three years later I returned with a working visa in hand. At 20 years old, my parents moved back to Utah from Kentucky. This move was something I had eagerly anticipated for over two years, something I was certain would fix all the troubles in my life. At 20, I believed I had two main problems, and between This Move and That Boy, all the things wrong in my life would be magically right. What a simple, and difficult lesson it is to learn that no one event, certainly no one boy can fix all the problems in my life. At 20 years old, I saw the Spice Girls in concert. I flirted with a man named Romeo at an outdoor restaurant in Italy. I watched the Olympics in Trafalgar Square. I graduated with my MSW. I got my first job. I started a 401K. That silly, wonderful, thought-she-knew-what-“finally”-meant, 20-year-old Jill.